Sketched from nature, by George H. Goddard. Until the discovery of the rich silver mines of Washoe, this remarkably beautiful lake was known only to the few. It is true that the footsteps of the old mountaineer, the early explorer, and the pioneer emigrant, trod its silent shores at a very early day; and in later years the hardy prospector, in search of Gold Lake, and other fabulous localities of supposed wealth, looked upon the burnished waters, and cloud-draped crags that encompass this beautiful sheet, with charmed eyes. But it remained for the living tide of population that poured into that region over the Sierras, in search of the precious ores, during the excitement of 1860, and subsequently, to make this scene become extensively familiar; inasmuch as a magnificent view of Lake Bigler can be obtained, on reaching the summits of the surrounding mountains, from nearly every northern trail into Washoe, especially that from Placerville, without even turning aside from the road. It may not be generally known, that, at the heads of nearly every stream originating among the snows of the Sierra Nevada, there are extensive lakes, or fertile valleys, from the Siskiyou mountains to Fort Yuma. To these retreats the stock raisers of the midland counties take their droves, when the feed in the Sacramento and San Joaquin valleys becomes scant, or dried up during the dry months of summer. Since the excitement before alluded to, numerous companies of prospectors have gone out in the hope of finding rich veins of silver-bearing quartz; and, in addition to discovering the valuable mines of Mono, Esmeralda, and others equally rich, they have returned with ever-to-be-remembered mind-pictures of those scenes of beauty and of grandeur, that he slumbering in lofty solitude among the rocks and peaks and stunted pines of this great mountain chain. “This beautiful lake is situated in a valley of the Sierra Nevada at the eastern base of the central ridge, a few miles north of the main road of travel to Carson Valley. It lies at an elevation of some 5,800 feet above the level of the sea, all about 1,500 above Carson Valley, from which it is divided by a mountain ridge three to four miles across. “The southern shares of this lake were explored during the state wagon-road survey of 1855, all its extreme southern latitude determined at 38° 57'. The 120th meridian of west longitude divides the lake pretty equally, giving its western share to California and its eastern to Utah. Its northern extremity is only known by report, which is still so contradictory that the length of the lake cannot be set down with any thing like accuracy. It can hardly exceed, however, twenty miles in length by about six in breadth; notwithstanding, it has been called forty, and even sixty miles long. “The surrounding mountains rise from one to three, and, perhaps, in some cases, four thousand feet above the surface of the lake. They are principally composed of friable white granite, so water-worn that, although they are rough, and often covered with rocks and boulders, yet they show no cliffs or precipices. Their bases, of granite sand, rise in majestic curves from the plain of the valley to their steeper flanks. Many of the smaller hills are but high heaps of boulders, the stony skeletons decaying in situ, half buried in their granite debris. The shores of the lake, at least of its southern coast, are entirely formed of granite sand; not a pebble is there to mar its perfect smoothness. “A dense pine-forest extends from the water’s edge to the summits of the surrounding mountains, except in some points where a peak of more than ordinary elevation rears its bald head above the waving forest. An extensive swampy flat lies on its southern shore, through which the Upper Truckee slowly meanders, gathering up, in its tortuous course, all the streams which flow from the south or south-east. The deep blue of the waters indicates a considerable depth to the lake. The water is perfectly fresh. The lake well stocked with salmon and treat. It is resorted to at certain seasons by the neighboring Indians, for fishing. “Although lying so near the main road of travel, little has been known of this lake until quite a recent period. 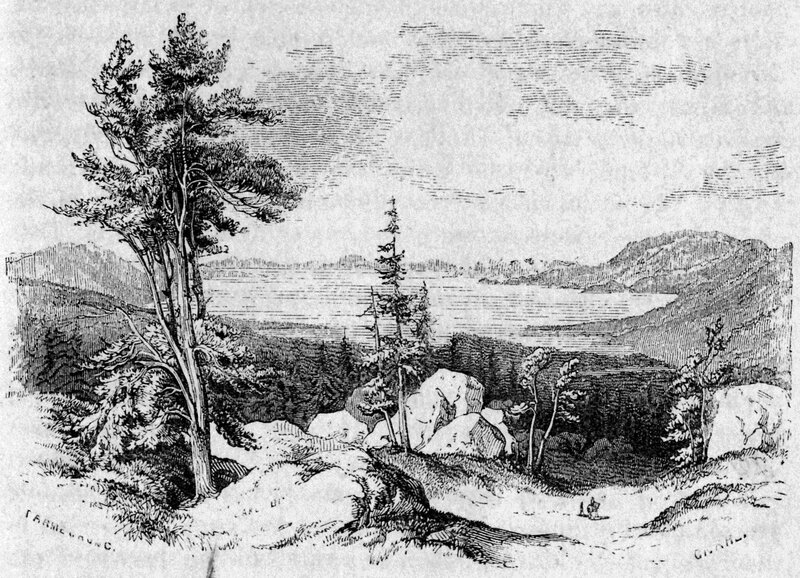 There is no doubt this is the lake of which the Indians informed Colonel Fremont, when encamped at Pyramid Lake, at the mouth of the Salmon-Trout or Truckee river, and which he thus relates, under date of January 15, 1844: ‘They made on the ground a drawing of the river, which they represented as issuing from another lake in the mountains, three or four days distant, in a direction a little west of south; beyond which they drew a mountain, and farther still two rivers, on one of which they told us that people like ourselves travelled.’ How clear does this description read to us, now that we know the localities! “Afterward, when crossing the mountains near Carson Pass, Colonel Fremont caught sight of this lake, but, deceived by the great altitude of the mountains to its east, and the apparent gap in the western ridge at Johnson Pass, he laid it down as being on the California side of the mountains, at the head of the south fork of the American River. In the map attached to Colonel Fremont’s report, it is there called Mountain Lake, but in the general map of the explorations by Charles Preuss it is named Lake Bompland. In Wilkes’s map, and others published about the period of the gold discovery, it bears the former name. When Colonel Johnson laid out his road across the mountains, the lake was passed unnoticed, except under the general term of Lake Valley. General Wynn’s Indian expedition, or the emigrant relief train, first named it Lake Bigler, after our late governor. Under this name it was first depicted in its transmountain position in Eddy’s state map, and thus the name has become established.